We’re in the busiest time of year for us at the volunteer centre at the moment. I think it’s all the good weather that makes everyone want to stay here around now …..
We’ve been back on our main project of the year, working on the lakeshore path at Wray Bay. 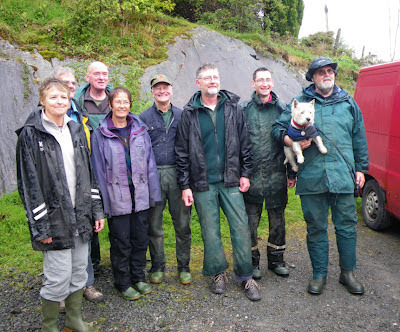 Community Drugs Outreach Trust, fresh from their first day with us pulling Himalayan Balsam (mentioned last month), helped us for a typically wet and muddy day. It might have been less than perfect weather but such was their enthusiasm that the hardest part of the day was getting the group to stop at packing up time! CDOT members relieved to have got that boulder out! Rochdale Dukes give the new waterproofs a postive review! On the theme of keeping dry, we had a particularly busy week with a National Trust working holiday and our woodland ranger building a new woodshed. Using green woodworking techniques they’ve built us a fantastic frame. The rain forcing most of the work to be done inside didn’t do much for our floor and there’s plenty more work to be done but this is a great start to ensuring our future volunteer groups have a nice dry supply of wood. You can visit the Basecamp Facebook page for more on this woodshed project. The Basecamp in full workshop mode - we did manage to clean the carpets! At the moment Basecamp is stuffed to the gunnels (in a true sense, not an Olympic stadium sense) with one of our biggest groups: West Runton Scripture Union. 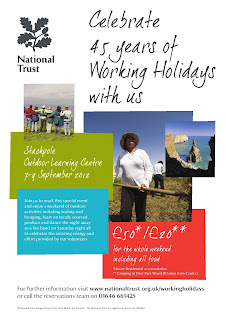 They’ve been coming to Basecamp since 1969 so are a great link to the past for us and always stay for two weeks with a gang of up to 30 volunteers. With more rain forecast tomorrow our drying room is going to be working hard! Touching the lives of children. Sometimes life presents us with experiences or opportunities that remind us of those important things in life that can too easily be overwhelmed by our routines. I had one such experience recently when the Lake District’s mountain rescue teams headed up by Keswick Mountain Rescue Team hosted a number of families through the WellChild, Centrepontand Child Bereavement organisations. This was in response to the involvement of Prince William who is patron of the Mountain Rescue (England & Wales) and is also involved with his brother Harry in these charities. He is keen to see the charities sharing and supporting one another. So the Lakes Rescue Teams stepped in and offered a weekend of activities to children who are being supported by these organisations. We hosted the children with their families and gave them a number of experiences including a simulated mountain rescue, a four wheel drive trip, a trip on the lake, some abseiling & climbing plus a trip to the summit of Latrigg (a mountain overlooking Keswick and Derwentwater) – things they would not have been able to do without the kind of support that organisations like the rescue teams can give. I was involved with WellChild. We were expecting 6 families but unfortunately two children were not well enough to make the journey. Of the four who came, sadly one has passed away since the trip. The feedback since his return to the Hospice is that he had loved everything he had done over the weekend. You can read more on the WellChild website here. What many of us might have taken for granted became hugely significant and reminded us of how fortunate we are – those little, daily irritations became irrelevant. It was a pleasure to spend time with these families. Later in the week I worked with some of our regular Trust volunteers – this time cutting back bracken along the side of the path on Kinn End. Kinn End is basically soft, friable Skiddaw slate with overlying grass so in places it is particularly vulnerable to erosion. We minimise the problem by switching walkers between two routes at intervals. There are two stretches of path about 20 metres apart and, using bars across the path as shedding gates, we ‘bounce’ the walkers between the two every two years. This is long enough for the vegetation to recover and strengthen before it is subjected to trampling again. This is a very popular route that is part of the Coledale Round and this is the best way we have found to protect it from the permanent damage that could otherwise be caused by such heavy usage. Another task was a form of archaeological dig I suppose! We were looking for an old septic tank, waste-water manholes and drains in Cockshot Wood. We needed to work out which are still in use. Over many years there has been an accumulation of these in the area. 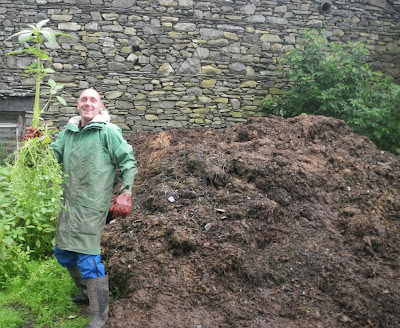 It wasn’t the most glamorous job we have done but my volunteers were undaunted! 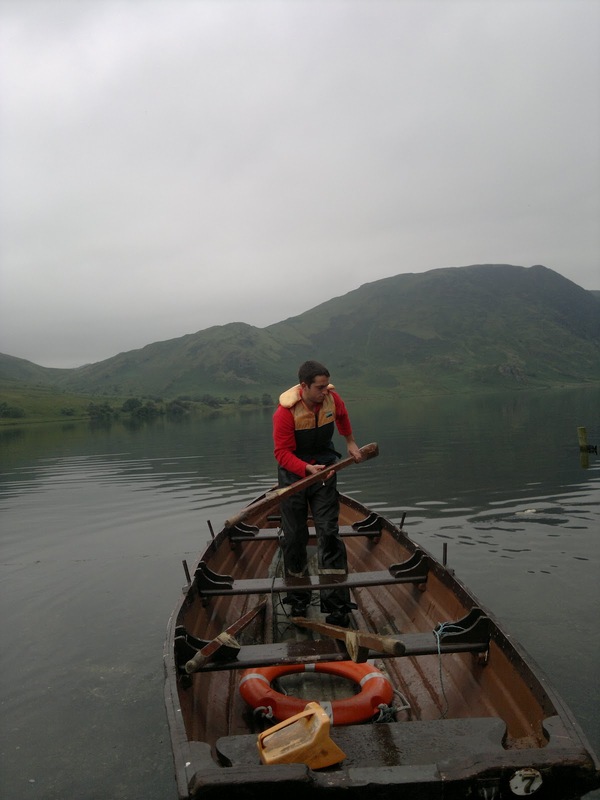 We have some boats moored on our lakes, primarily used by fishermen but also popular with people who just want a different experience of the lakes. While on a normal path inspection of the Buttermere lakeshore we noticed that the boat usually kept at Hasness was nowhere to be seen, a quick check told us it had not been hired and given the stormy weather we’ve been having it seemed obvious it had just floated away, “not to worry" we thought, “it won’t have gone far”. How wrong were we, after circumnavigating the lake twice, searching under trees and overhanging lake edges we eventually discovered the boat firmly lodged in a willow tree at Buttermere Dubs, between Buttermere and Crummock water (pretty impressive navigation for an unmanned boat) it had travelled 1.2 miles turned itself backwards, reversed down the river and managed to climb a tree! 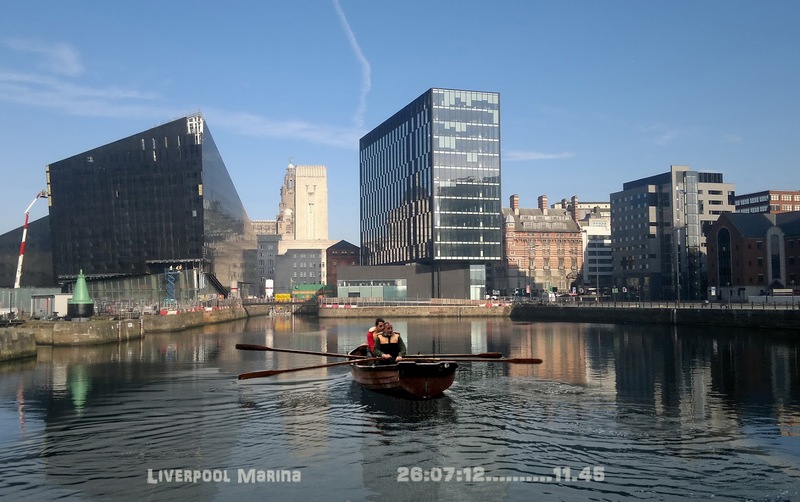 Not to worry, we’ve got the regular volunteers coming in on Thursday they’ll help.Thursday morning arrived with the news that due to a ‘clerical error’ we had to remove all boats from all the lakes!!! I couldn’t help but wonder about previous days with volunteers and boats, something about the mixture seemed to always end up in a surreal experience somewhat akin to Fawlty Towers but directed by Quentin Tarantino, would today be any different? Anyhow we set off, Rangers Dan and Paul with volunteers Jim, David and Theo, minus Phil having a break in Cos. Once we arrived at Crummock Water a plan was hatched, David and Paul would, with the help of a quad bike (which refused to engage 4 wheel drive) drag, push and heave the boats out of the lake and onto the boat stands whilst Dan and Jim set off in another boat to row up stream and rescue the boat from the previous day.. With me so far? Paul and David had a few ‘technical’ difficulties not helped initially by discovering Dan had taken the Land Rover keys with him and so we were bereft of tea and pies, and so it had taken quite a bit of time to get the boats off the shore, only then did we wonder just why Dan and Jim had been gone so long, as we pondered their predicament we noticed two rather soggy looking shapes approach from the nearby woodlands both with life jackets on and oars over their shoulders, Theo beside them looking bedraggled and dragging his tail. What could have happened, had they sunk? Capsized? Was Jim’s tobacco still dry?? All four of us and Theo set of on the most direct route to the boat, straight across the marshes; like a scene from a badly shot Vietnam movie we waded, jumped and fell from tussock to tussock but mostly into deep puddles until we reached a bridge near the boat, by virtue of having the longest legs Dan was selected to remain on that side of the river and go to the boat with a long rope whilst we headed across the bridge and up stream. Once Dan was in position up a tree, all that was needed was for him to tie the rope to the boat, throw it to us and we’d pull it free of the tree and over to our side. On the third attempt Jim (showing an impressive agility for a man of his age!) 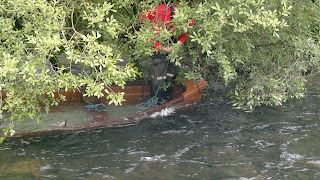 grabbed the rope and we pulled the boat across, not easily as it was completely full of water. 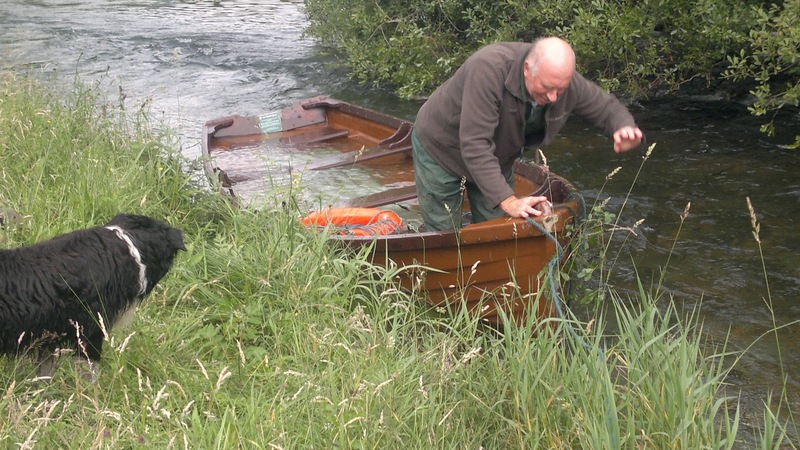 We now had a new problem - we had the boat but on the other side of the river was Dan, with the bucket! Not a problem, we’d throw the life buoy to Dan and he’d tie the bucket to it and we’d haul it across. We were confident this would work, after all Dan had grown up on a farm, he’d know how to tie knots wouldn’t he? 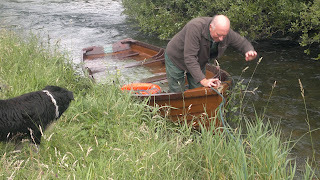 The bucket came flying across and landed just beside the boat...just as Dan’s knot came undone and it floated at remarkable speed downstream...D'OH!! No worries, ever calm, David decided he’d go off in search of another bucket. It’s amazing how useful litter can be sometimes - no sooner had he disappeared Dan found another bucket close by - we tried our technique again and this time it worked and soon we were starting to bail out the boat while Dan returned to the bridge and came to join us. Now we had a boat, three men, and a rope. 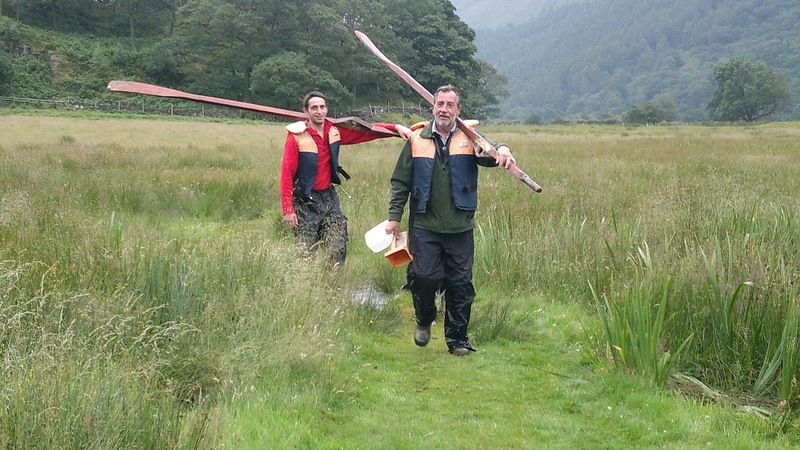 It seemed reasonable that we could now set off pulling the boat upstream against the current, through the trees and on to Buttermere. What on earth were we thinking? Like three wet and frail draft horses we set off and had made impressive progress when we realised the boat was getting heavier. Turns out there was a large hole in it and it was filling up as we dragged it through the current. Nevertheless by the time David re-joined with not one but two buckets, we were near the last obstacle; a weir formed by a fallen tree. Some gymnastics, acrobatics and general falling down saw us over come this and with a flourish we broke through and into the lake! Hurrah.. 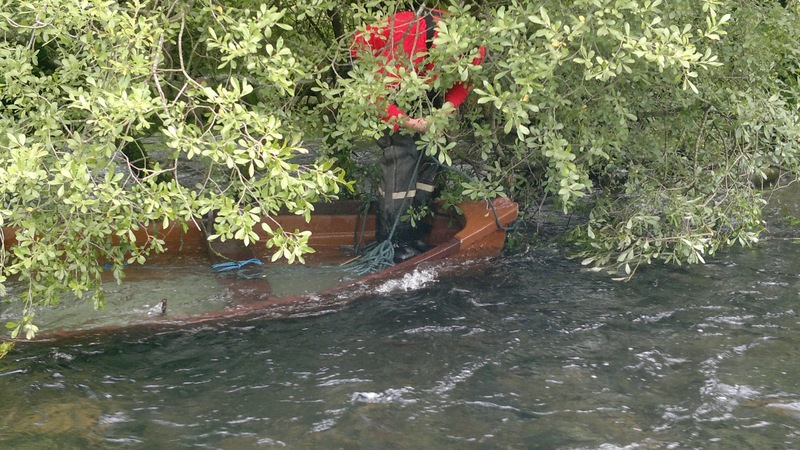 Hang on… we still have a boat moored downstream, we’d left jackets and worse than that Jim’s tobacco behind. 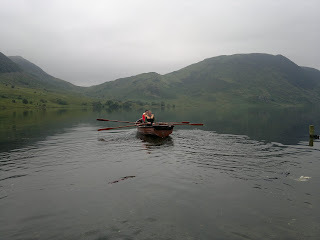 Dan generously volunteered (was coerced) to go back and row the boat back to the Crummock water moorings whilst we walked back through the woods. It was a nice sunny day by now and we presented the tourists in the village with an odd sight, three very wet sweating old blokes with ropes and buckets all looking quite pleased with ourselves! Soon we were back at the shore sorting out the other boats when Dan hove into view, looking very much like a young Steve Redgrave he fought the waves and current and beached his boat…time for a late lunch… We’ll sort it all out tomorrow. Well summer holidays are here and so is the rain! Hopefully it won't put a dampner to our free kids events every Thursday between 2 - 4pm. 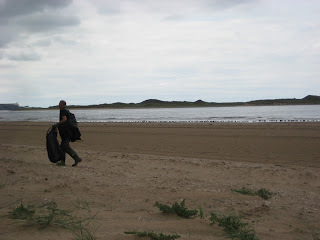 It starts this Thursday with beachcombing. 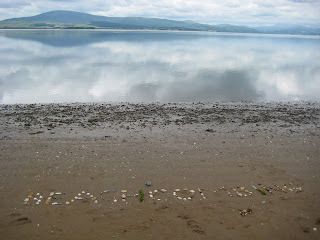 A gentle stroll along our lovely beach to look for shells and other marine life left behind by the tide. A great way to start a shell collection. Help us to clean up the beach so that everyone can enjoy this beautiful place. From birds to butterflies and a fantastic show of flowers; a fantastic chance to see some of the rare and special wildlife that thirves at Sandscale Haws. 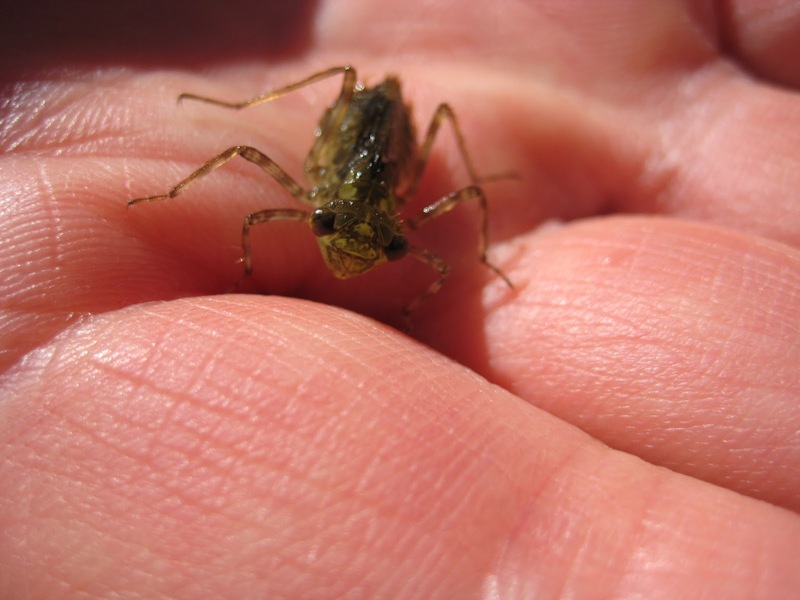 Explore the fascinating underwater world of a stream using pond nets to catch all kinds of weird and wonderful mini beasts. A variety of fun family events including beachcombing, pond dipping and sand sculptures competition. Come along at any time between 12 - 4pm. 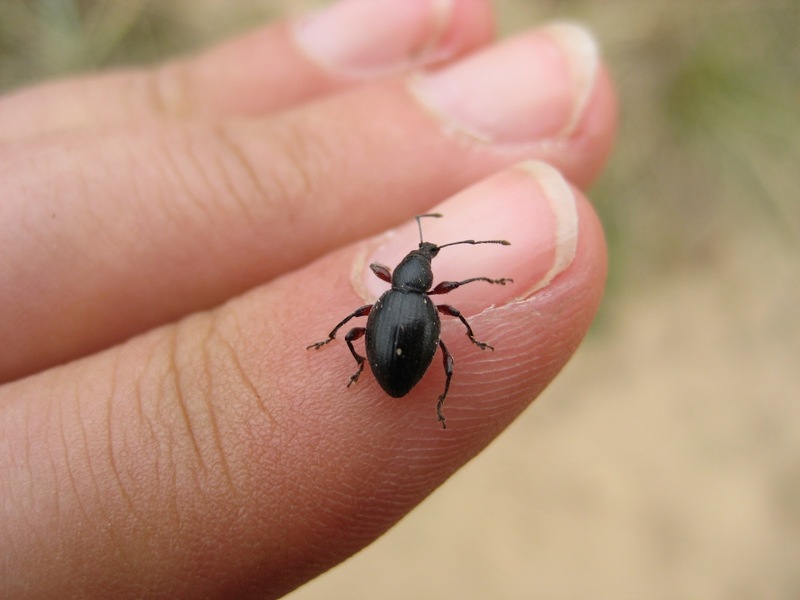 Take a journey into sand dunes to explore the hidden world of minibeasts. Use pooters and pitfall traps to help the rangers to record what you have found. 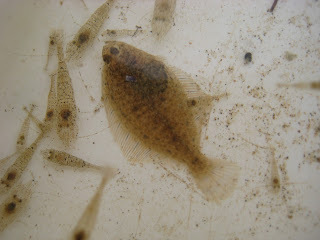 Use pond bets to fish for a variety of weird and wonderful sea creatures in the Duddon Estuary at Low Tide. Nets and trays are provided. 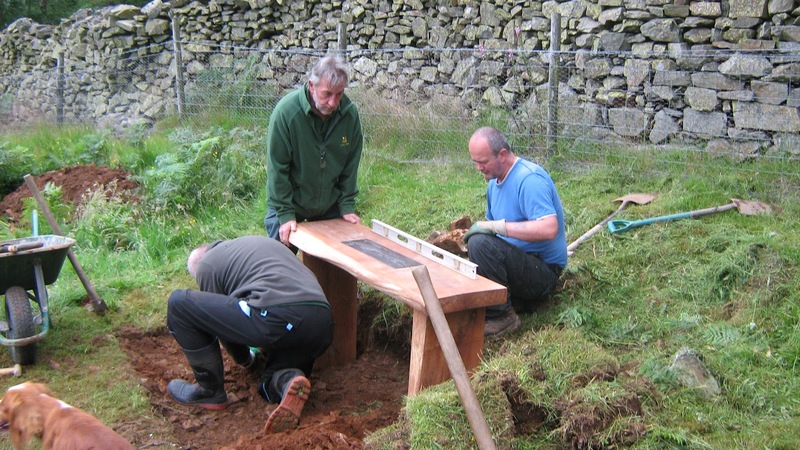 The Upland Ranger team has spent the majority of the summer curing man made erosion on the high fells and one of the first tasks on the large scale projects is to erect the teams shed. We have the shed flown up to worksites to give the team some vital protection from the elements.When you’re working in horizontal rain and being buffeted by the wind then it’s a real morale boost to have a break from it at lunchtime. It’s your normal garden shed that you can get from any garden centre but with one or two adjustments so that it can withstand the notorious Lakeland weather. 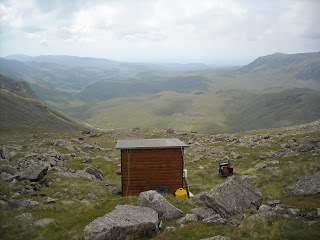 We often get asked by walkers what the shed is for.We have a sign on the door explaining why it’s there but sometimes people have a guess anyway.We’ve overheard people suggesting that it might be overnight accommodation, a hide to spot wildlife and on one occasion someone even thought it was a drinks kiosk. The shed has often been mistaken for a toilet and when people arrive to use the facilities and find that it’s just a shed then they take advantage of the high sides and cover it provides anyway.Embarrassingly for all involved, it’s sometimes whilst we’ve been in there.With one particular shed, we seemed to attract a number of low flying military aircraft day after day and we wondered if the shed played a part in target practice. Most of the time we don’t have the luxury of having sheds because much of what we do is smaller, maintenance type work and so sometimes you have to improvise when a break from the weather is needed. I should say that the photo is from winter time on top of Crinkle Crags and although we’ve had some rough summer days so far, it’s not been that bad. 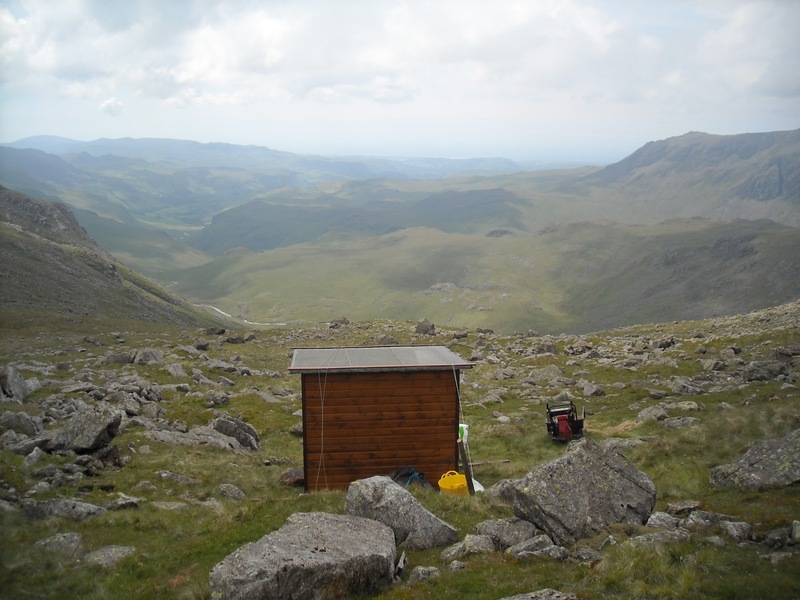 Where possible, we try and keep the sheds tucked away and discrete but if you do happen to see one on some remote fell side then you now know why it could be there. Journeys in the 21st and 16th centuries. Since last writing, I have had another session working with a group of our regional volunteers - the group that brings a cake! We were repairing some of the damage we have had on the Catbells terrace path and also on the mine track on the Newlands side of Catbells. A few weeks ago we had a heavy rainfall event where a lot of water falling in a short time onto dry summer ground had done some damage. It could have been worse but some earlier work, again done by volunteers, had helped minimise the damage. We were repairing that by putting in wide, angled ‘sleeping policemen’ to shed the water across the path as quickly as possible. A lot of hard work was completed, the cake was up to the expected standard and the foxgloves were at their best! 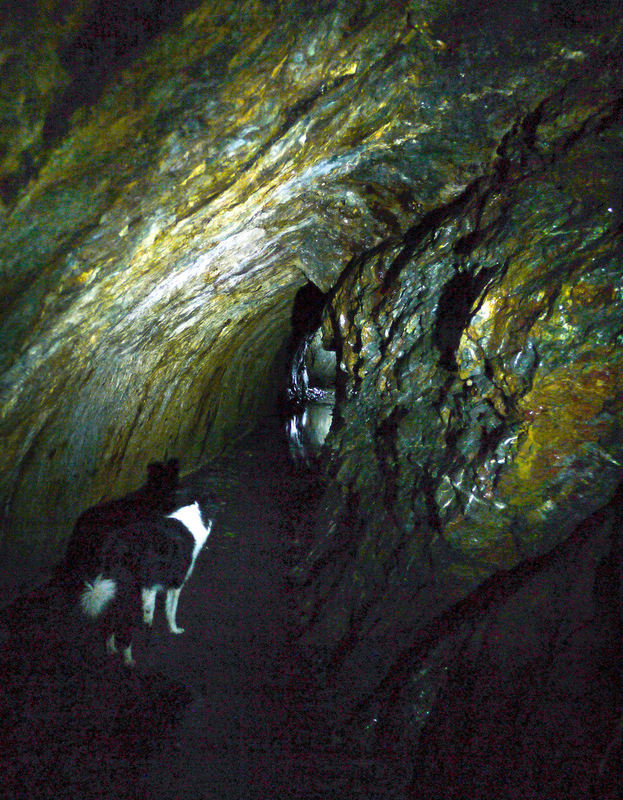 Then, one evening, a friend and I made an excursion into the disused Goldscope mine in Newlands valley. 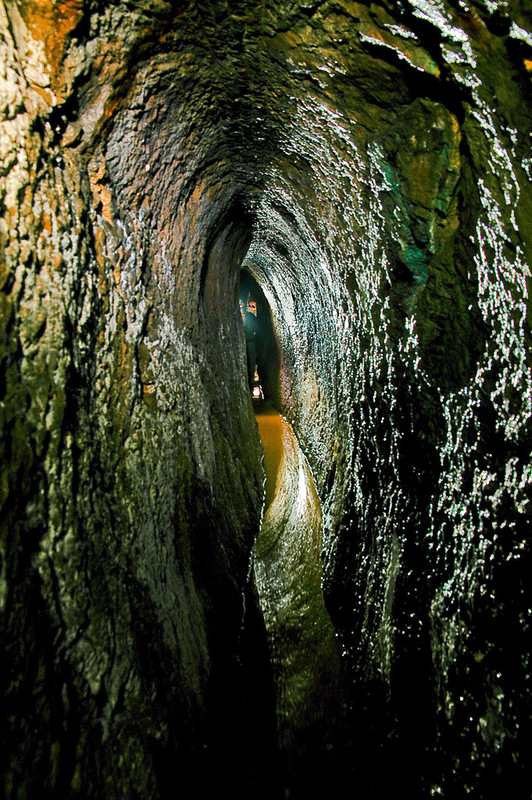 We explored a passage that carried water along a leat from the Elizabethan stone and turf dam on the fell-side above the mine. 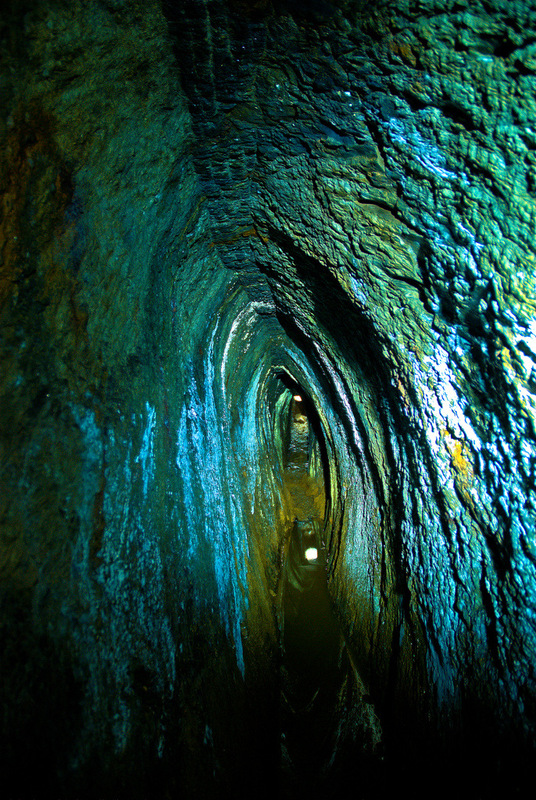 The water entered the level and travelled through from one side of the hill to the other. 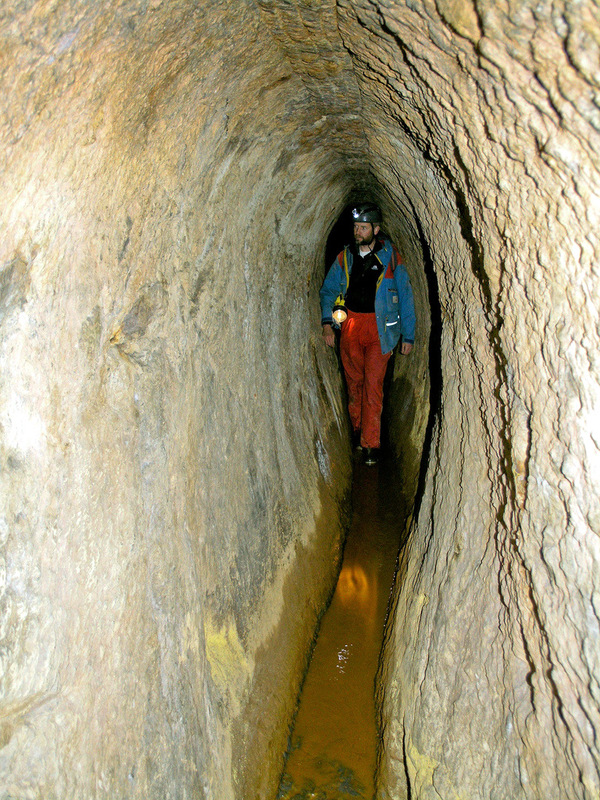 These passages were named coffin levels because of their shape. 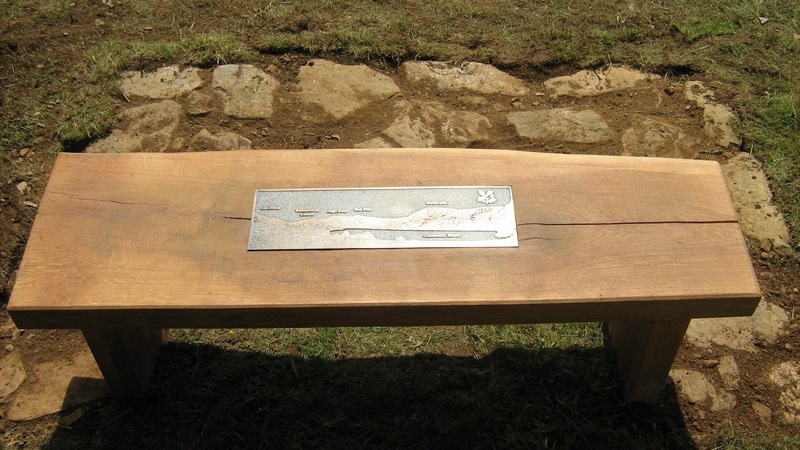 This shape minimised the amount of stone they had to remove to create access for a man. 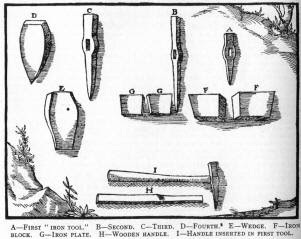 The levels predate the late 19th century and were hand-picked using iron tools much like those illustrated in the 16th century book De re Metallica. 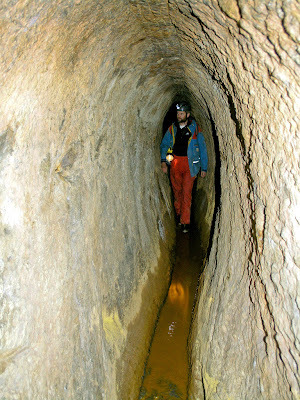 Children would have been employed in the early stages of digging out these passages. 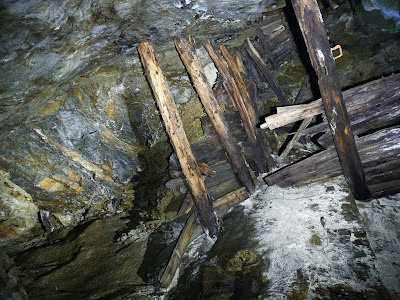 Many of these coffin levels were subsequently destroyed when explosives were developed that could be used to enlarge them and make it easier to bring out the ores. This one survived because it was used only for water. About half way through this passage there was a chamber with a water-wheel that powered a chain system that dewatered the lower mine levels. 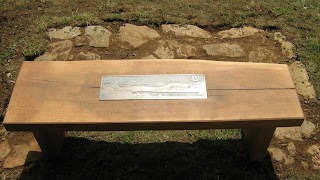 This too was cut by hand – the picture shows the tool marks clearly. 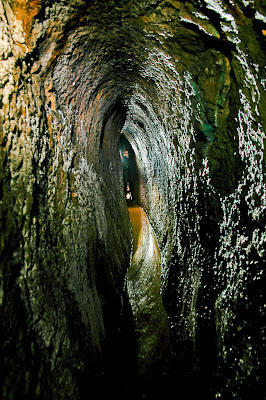 The water continued through the hill-side and was then used to power another wheel for the stamping mills. 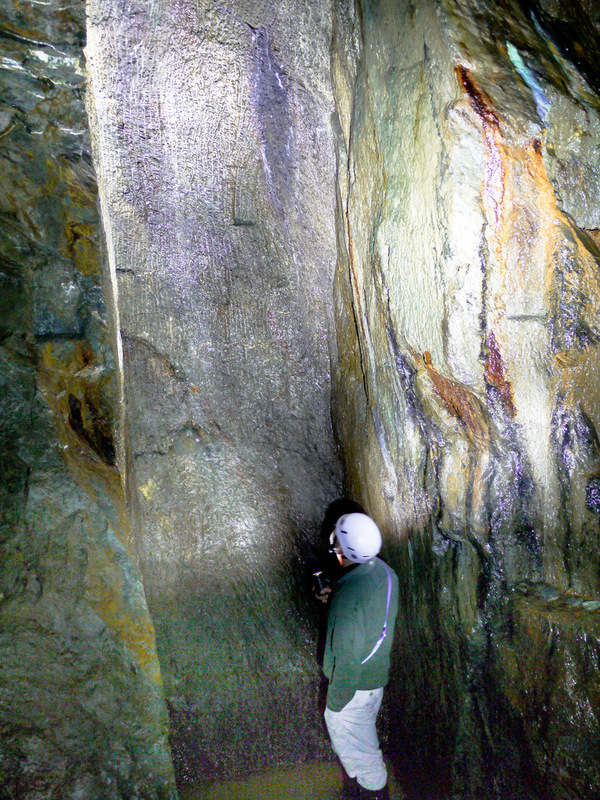 It is awe-inspiring to stand in these passages knowing that such massive works were carried out using just hand-tools. 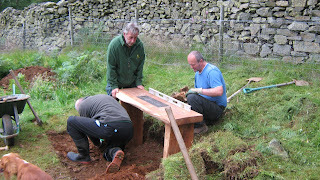 Another variety filled week for the Loweswater based ranger team, firstly with the help of Volunteers Jim David and of course Theo we helped valley ranger Mark install a memorial bench at Scala, you probably know it better as Lanthwaite! 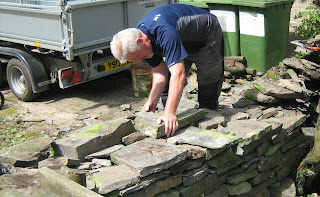 We decided to make the wall safe in manageable sections to give us a stable base to work on, the garden side of the wall was some three feet lower than the top side and took a while to stabilise. 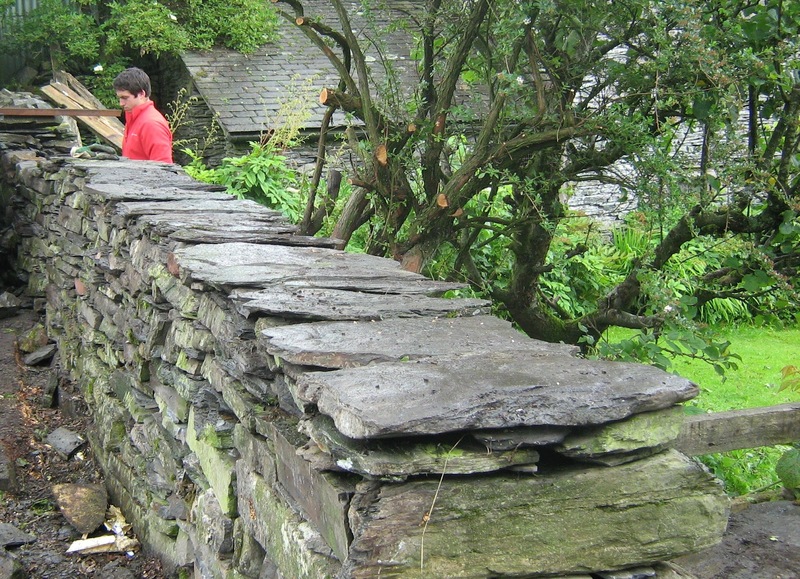 We soon made good progress although when walling with slate it can be difficult to gain height, however the slate also enabled us to include several through stones and a complete coverband to the wall top, a rare luxury when walling with our usual types of stone. All that remained was to use the remaining stone to top of the wall and with the thanks of a happy tenant we were done! 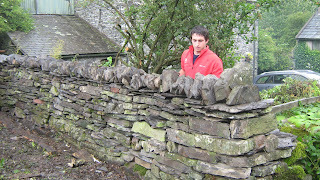 From here we’re off to the fell wall above High Nook to repair some more gaps! 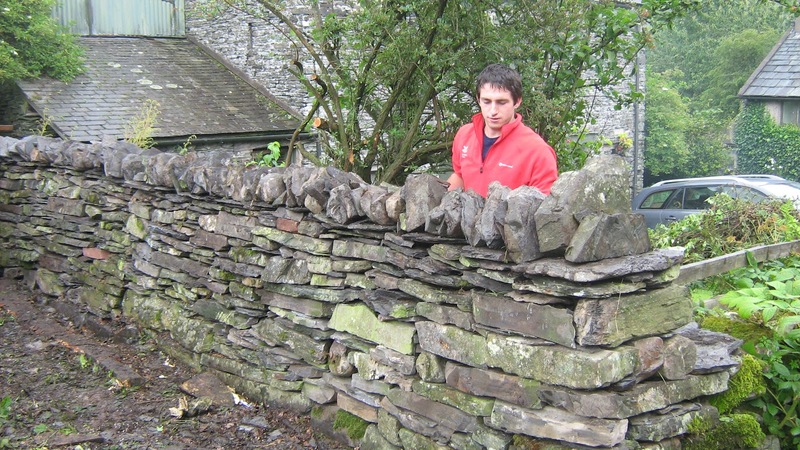 Anyone would think we liked walling!! The weather over the last few weeks has been more like October but warmer, it hasn't stopped us working but it has made the ground conditions more challenging! 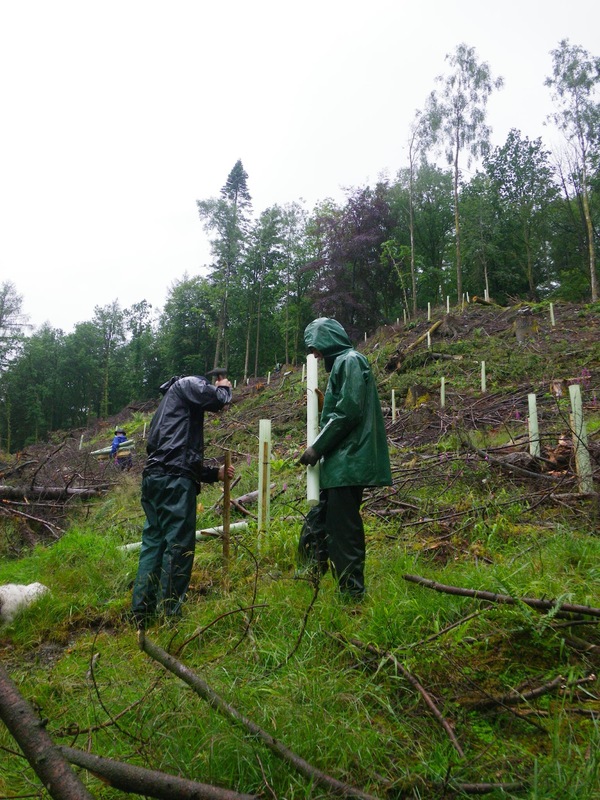 Last week I was out with a hardy group of volunteers in the rain (again) protecting naturally regenerating trees in Guards Wood. If you imagine what summer should be like then that's the perfect time to go on a dragonfly hunt, a nice warm sunny afternoon with not too much wind. 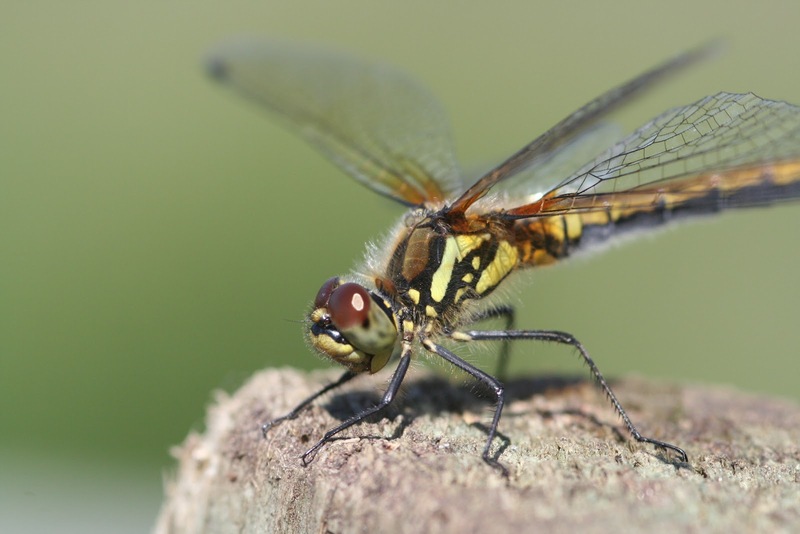 With names like Hawkers, Darters and Chasers dragonflies are amazing insects, fossils show they have been on the wing since the dinosaurs - they were much bigger then some had a wingspan of 30cm! The adults we see flying around can be up to five years old, golden ringed dragonfly larvae spend most of their lives living in mountain streams before emerging into the insects we see. 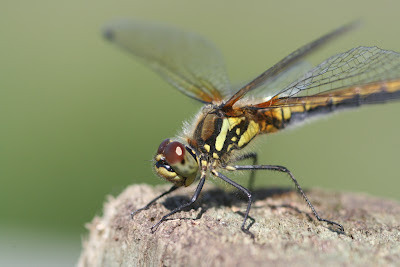 Adult insects can often be seen hunting away from water, Southern Hawkers are often found in woodland glades and will quite often fly up to have a look at you if you get in their way, don't worry contrary to old wives tales they won't bite! Dragonflies eat other insects which they catch in flight, they eat smaller prey on the wing but often hang up to eat larger things like butterflies. I have seen a Golden Ringed dragonfly eating a bumble bee! For such brightly coloured insects they disappear very easily when they land which makes finding them quite a challenge, a pair of binoculars really helps. Darters often land on rocks or fence posts which makes them easy to find and photograph. So if the sun ever does come out ... do look out for these amazing insects. A lot of the jobs we tackle can only be done at certain times of the year and it’s about this time of year that Himalayan Balsam starts to rear it’s deceptively pretty head. You’ll probably have seen it, growing alongside a road or river. Maybe you’ve even thought how attractive its large pink flowers look. But it’s one the most aggressive invaders of our countryside, becoming an increasingly familiar sight alongside our roads and streams as it spreads by seeds being carried along watercourses. There’s a relatively short window of time to get it: it needs to be big enough to identify but not so big that the seed heads have matured. When they have, they pop with impressively explosive force when touched, spreading more seeds. We also need to make sure we tackle it in the right places - if there’s more left upstream those exploding seed heads will quickly send reinforcements down to repopulate a cleared area. 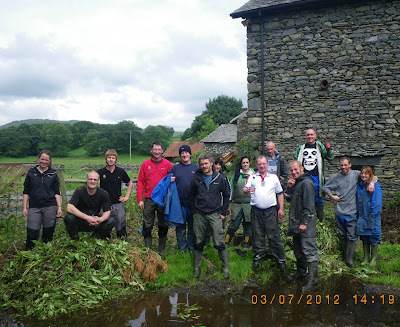 So, along with the Cumbria Freshwater Invasive Non-Native Species (CFINNS) Initiative – a county wide scheme helping to coordinate many organisations and put together the bigger picture of where the balsam is growing on different landowners land – we’ve been out with our volunteer groups clearing a couple of ‘motherlodes’ of balsam at the tops of watercourses. Unfortunately this has lead us to some decidedly unglamorous places. A first trip out with the South Lakes Conservation Group to an old united utilities sewage works was smelly enough. 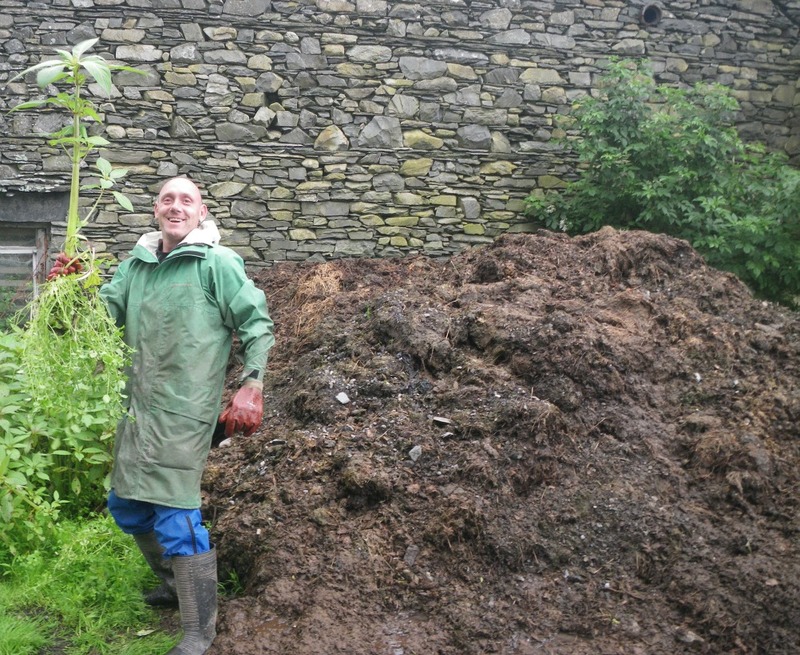 However, we’ve continued that theme this week with a visit to a farm with CDOT (Community Drugs Outreach Trust) where the balsam was growing in a massive heap of manure! 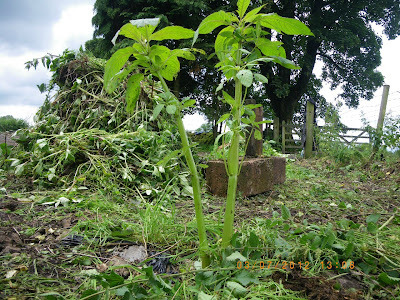 At the end of these days though we’d done some great work to really knock the plant back. And if that means we see a few less of those pink flowers it makes it all worthwhile! 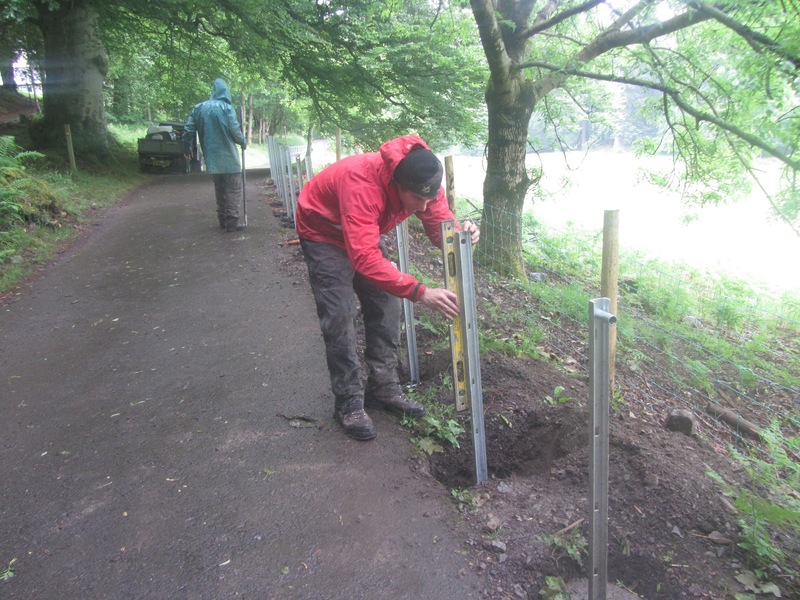 As the old metal railings at Hawse End were looking sorry for themselves we thought it was time to replace them. We could have built a normal stockproof fence with posts and netting - it would certainly have been a cheaper option - but this would not align with the nature of the property. 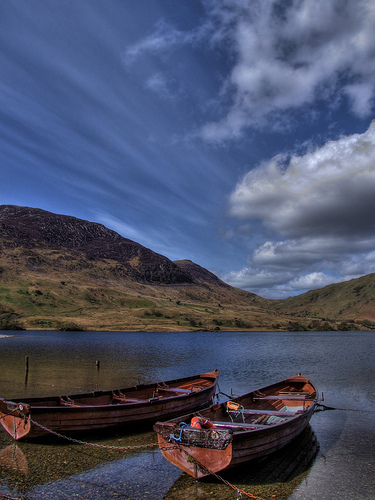 Hawse End is a natural continuation of Brandlehow Park, the National Trusts’ first acquisition in the Lake District. As such it is a very special place, and needs that bit extra. Metal railings just feel right. So we started off with a volunteer group helping us take the first section of old railings down, and put up a temporary fence. With the temporary fence up this allowed us to work on the first section of new railings. When we came to take down the other section of the old railings we thought we would bring in reinforcements, because we didn’t want to go through another 100 hack saw blades. So we called upon the Forestry team, and with no problems they just pulled the fence out with their forwarder. At the same time they brought along some spare timber to use as a revetment, which was backfilled with stone and soil. The most time consuming part of the job was getting the uprights of the fence into place. To get it correct we had to get the uprights level in all dimensions, and to make sure that we were following the correct line. As seen in the picture above. Once they were level and upright we then added cement to secure them. When the uprights were all in the job became a bit easier and less stress free. The poles were then threaded through the uprights to complete the fence.